The apocalypse is happening! Participants will race to collect survival supplies. After all of the supplies have been collected, we will read a pre-written apocalypse scenerio. Points will be awarded to participants who have collected certain materials. The person with the most points by the end of the story is the survivor and winner! Regular Zombie has no intelligence. You cannot run. You cannot guard the doctor if you’ve found him, and the only thing you can say is “Brains!”. You can say brains to scare your victim, or to ask another person if they’re a zombie. Runner Zombie, obviously, can run, unlike regular zombies. You cannot guard the doctor if you’ve found him, and the only thing you can say is “Brains!”. You can say brains to scare your victim, or to ask another person if they’re a zombie. 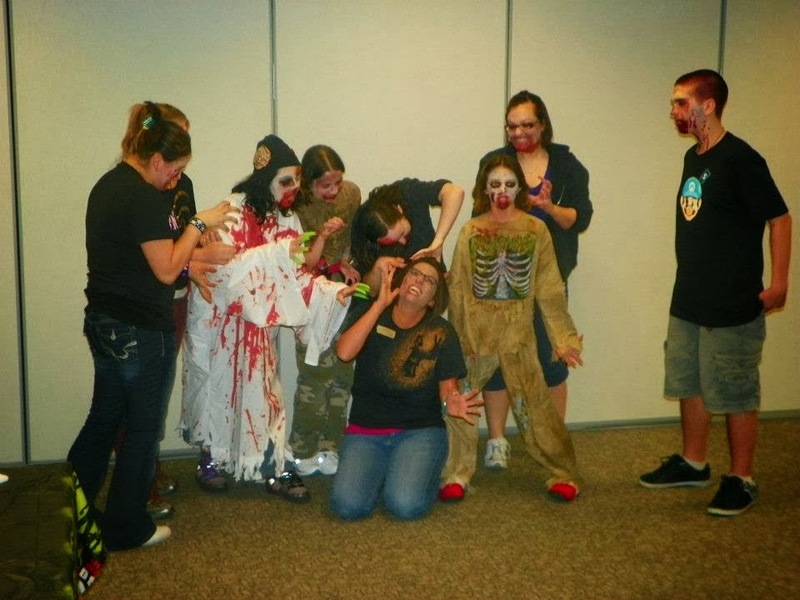 Chaperones will announce when zombies can walk and when they can run. The "doctor" (any pre-designated item) will be hidden before the game. 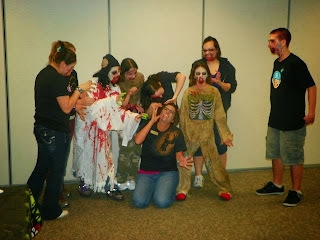 The zombies (regular or runner) have to wait one minute before they turn from humans into zombies. Set a timer with a ring if it’ll help. At least two humans must find the doctor (he or she has the antidote, of course) and bring him or her to a designated spot. If the humans bring the doctor to the designated spot safely, then it’s a human victory. If everyone is zombified, then it’s a zombie victory. Dissecting old dolls and recreating them...barbie head on transformer body?? Do you have any fun programs planned for October?